This is Indy, Ch Blazingstar Brown Ruff CD WC. Today I met Indy and his owners at our vet clinic to have blood drawn for Optigen. Indy was diagnosed with an "optic nerve coloboma" in his left eye four years ago at his CERF eye exam. It basically means he has a small notch out of his optic nerve. It is not big enough to effect his vision and it is no big deal for him. But we were advised that he probably shouldn't be used for breeding incase he produces it to a worse degree in his offspring. 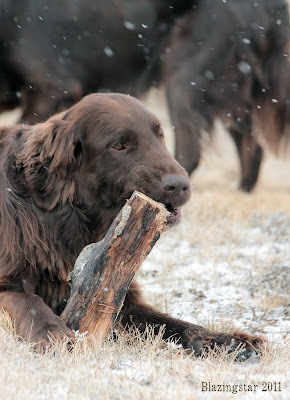 We were surprised, as this is an extremely rare condition in flat-coated retrievers and we are not aware of this problem in his background. His parents and grandparents all passed their eye exams, as did his littermates that have had eye testing. We have been open about Indy's coloboma and included it in his information on a couple of the flat-coat databases. Because of this, we were recently contacted by another flat-coat breeder with information about a research project, looking at coloboma's in several breeds, including flat-coated retrievers. The work is being done by Optigen, a veterinary genetic testing company. They hope to be able to find genetic markers and possibly even understand the mode of inheritance of colobomas. So today we shipped off Indy's blood and a big stack of paperwork (pedigrees, eye exam results for him and for his parents, etc,) to Optigen in the hopes that he can add to the understanding of the disorder. I love that you are so open with your breeding Liz!, colobomas are extremely common in collies. It is only when open minded people work together we can come up with a cure for this in our beloved breed. I was part of the study that led to a genetic marker for EIC in Labradors. My little Libby will have to be spayed because she has retinal dysplasia. A heartbreaking find for me, as she was the first pup I've kept out of one of my own breedings (and it was MISSED on the CERF exam at 7 weeks when it should not have been). It is what it is and it will actually be a treat to be able to trial a female without the worry of heat cycles. She has an "innie", so I'm going to let her cycle once before I spay her. Her vision is great and she is a fabulous marker...almost ready to run her first Derby! Happy 2nd Birthday to the Wildflower Puppies!